Low vase and cover of cloudy yellow and red jasper, with two handles and mounts of gold, enamelled and jewelled; handles are two slender scrolls of gold fixed under the lip and on the gold mount of the foot, enamelled on all sides and each having mask at upper end and in middle; foot edged with gold, engraved with festoons, filled with translucent enamels, having six cartouches in relief, each set with square ruby or diamond; dotted ground; convex cover, unmounted, enamelled finial in centre with double mask of Cupid supported by two cornucopiae and surmounted by square setting containing a ruby crystal. Origin: German (? ), probably early 17th century; gem-set mounts of enamelled gold are later additions - made before 1834 - perhaps English, c. 1820. Provenance: Formerly in the collection of the Dukes of Devonshire; recorded in a manuscript 'Inventory of Curiosities and Articles of Vertu at Devonshire House, 1834'; also listed under the heading of 'Vases of Stones' in the 1892 Inventory of Devonshire House, London; lent by the 8th Duke of Devonshire to the Burlington Fine Arts Club Exhibition of European Enamels, 1897; acquired by Baron Ferdinand Rothschild about one year before his death in December 1898, and visible in a photograph of one of the vitrines in the Smoking-Room at Waddesdon Manor towards the end of his privately printed Red Book, the Foreword of which is dated 1 November 1897 (see also WB.68-WB.70 and WB.72). Commentary: Recent gemmological checks have confirmed that all the gemstones are either diamonds or rubies, with the exception of the pyramidal gemstone set in the finial of the cover, which is a Burma spinel constructed of two conjoined pyramids, and therefore of nineteenth-century date. In Read 1902 and again in Dalton 1927 the mounts had been described as “German, 16th century”. However, on grounds of both style and technical detail the mounts - from the foot-rim and handles to the cover - seem no earlier than the modern pyramidal Burma spinel set in the finial. In particular, the drilling of the two holes through the neck of the jasper vessel and the crude bolting of the handles in place by means of rivets passed through those holes is contrary to known Renaissance practice and is unmatched among the well-documented material in the historic Schatzkammer collections of Europe. Even the bolting of the handles to the underside of the foot-rim gold enamelled mount is unparalleled, and certainly this goldsmith's failure to design the enamelled decoration in such a way that it would accommodate the interruption caused by the joining of the handles to the foot-rim is not characteristic of sixteenth-century Court workshop practice. This goldsmith has allowed the two holes in the enamelled gold foot-rim mount to go through the centre of the delicate translucent enamelled festoons - a solution that is both technically and artistically inept. The strapwork cartouches on the foot-rim mount are too large for the width of the decorative band, and in an improbable manner they overlap and 'break over' the upper and lower narrow enamelled borders of this band. Furthermore, the underside reveals no sign of the application of the ornament on the upper surface, not even the relief work of the six cartouches - which must, therefore, have been cast, not embossed. In addition, the six gemstones have been set entirely from the front without any fixing through the gold ground plate of the foot-rim mount. Stylistically, the finial on the cover strikes a familiar but less unconvincing note than the Augsburg silver-gilt example of c. 1590 on the ostrich-egg flask (WB.113). With its oddly shaped pair of cornucopiae and its flattened heads that are almost caricatures of the standard Renaissance Cupid, the finial of the Chatsworth jasper vase and cover has all the characteristics of an early nineteenth-century pastiche. The enamelled and gem-set gold mounts were, however, made before 1834, when the piece was briefly - and rather inaccurately - described in the Devonshire House Inventory as “a Moss Agate Circular Vase, Gold Enamel Scrole [sic] handle, enriched with Rubies, a Mask handle to Cover and Ruby on top”. 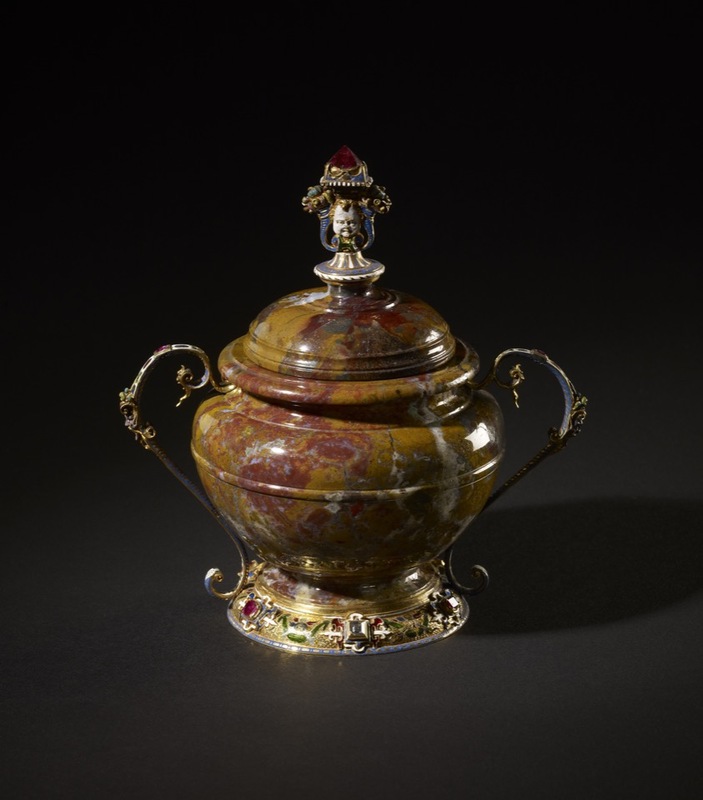 By the time the piece came to be more fully and carefully catalogued in 1897, when the 8th Duke first lent it for public exhibition, the enamel was stated to be “Italian, 16th century” and the finial “an uncut crystal of ruby”. Unfortunately neither statement can any longer be accepted, and as there is no corresponding mention of the object in the 1811 Inventory of Devonshire House nor in any of the pre-1834 records at Chatsworth, it may be assumed that the 6th Duke of Devonshire (born 1790, inheriting title in 1811, died 1858) was responsible either for its acquisition in its present state or for commissioning the various embellishments. His activities as a collector, especially his known interest in hardstones and mineralogical specimens, gems, marbles, and so on are discussed in the curatorial comment of WB.68. The covered vessel without its mounts is a fine example of lathe-turned and polished jasper, and in its simplicity and excellent proportions can be compared with several items in turned ivory that are preserved in the documented Schatzkammer collections. No better or more precisely dated example exists than the top element of the fully inscribed ivory three-tier casket, which since 1632 has been preserved in the Swedish Royal Treasury, having come from Duke Maximilian of Bavaria (1597-1651); the inscription reads: SERENISS. MAXIMILIANVS VTR. BAVAR. DVX. MANV PROP. F. (see ‘En Världi miniatyr’, Skrifter fran Kungl Husgeradskammaren - 2, Stockholm, 1982, p. 106, no. 146, col. pl. on page 49; ‘Wittelsbach und Bayern, II/2: Um Glauben un Reich, Kurfürst Maximilian I’, exh. cat., Munich, 1980, no. 683, illus. on p. 427, where it is dated “before 1623”, the year the Duke was made Elector). Consequently this jasper covered vase probably dates from the beginning of the seventeenth century and would have appealed to the taste of the 6th Duke of Devonshire; even the late embellishments would probably have struck no jarring note within his London circle of collector-friends, which included the Prince Regent, later George IV. Hugh Tait, 'Catalogue of the Waddesdon Bequest in the British Museum. III. The Curiosities', British Museum, London, 1991, no.26, figs. 259-262.